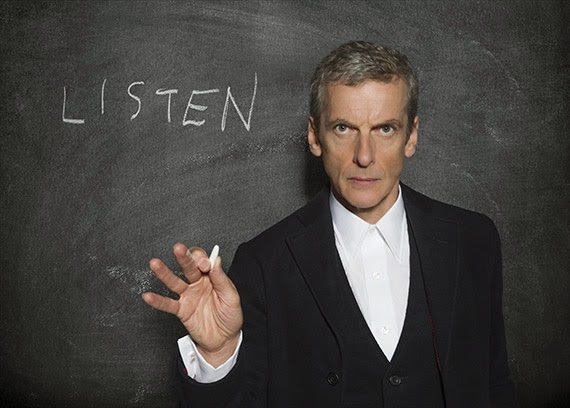 DOCTOR WHO - LISTEN Spoiler Free Review | Warped Factor - Words in the Key of Geek. Do we have a contender for best episode of the year? Here's our spoiler free review of Listen. So let's go over the season checklist. Regeneration/work out what kind of man I am episode - check. Obligatory contractual Dalek episode - check. Overly humorous episode - check. Scare the living daylights out of the little 'uns episode - shall we tackle that this week? Listen is Doctor Who at its absolute best, no dependency on the 'monster of the week' but rather relying upon psychological terror, playing on fears we all have had at some time, young and old. It's wonderfully written by Steven Moffat, arguably his very best script to date, and it wouldn't surprise me if in years to come when we look back at the Twelfth Doctor this may well be considered the defining story of Peter Capaldi's era. Director Douglas Mackinnon presents a truly creepy, eerie masterpiece. We've been promised scary stories before during Steven Moffat's tenure (most notably last seasons Hide) but Listen truly makes good on its guarantee, exceeding even Midnight on the chilling scale. There are two stand out scenes that will likely send youngsters longing for the safety of 'behind the sofa', and they both work fantastically well. Let's just say if you have sensitive children then you'll probably going to have trouble getting them to bed this Saturday night. Just so you know I'm going to be gushing over this for the remaining 300 words. The growing dynamic between Peter Capaldi and Jenna Colman is wonderful. Every scene they are in together is a joy to behold, it's as if they have worked together for years and in Listen both bring their A-Game to deliver award winning performances. Moffat is giving Clara the storyline she needed to truly be remembered as the Twelfth Doctor's companion, she's no longer the Impossible Girl and is fast becoming my favourite companion of the revived series. In the pre-season teases Moffat described this episode as "the story of a date and the Doctor having what appears to be a mild nervous breakdown." But I don't think he needs to reach out to Talking Therapy just yet as really he's just behaving even more Doctor-like than usual. We've been told we will see more of his alien side and that's what is starting to come to the forefront here. Our grey-haired stick insect Doctor has an itch that needs scratching and when you can travel in time and space there has to be a cure somewhere, right? Teaching, puts years on you! As well as being a perfect example of 'Behind The Sofa' viewing, Listen contains a punch-the-air-in-delight twist. A moment of brilliance that even M Night Shyamalan would applaud (and I'm talking Sixth Sense/Unbreakable early Shyamalan). Not only do we likely have the best episode of the series (it's going to be hard to beat), but we also have one of the greatest Doctor Who episodes of all time. Listen premieres Saturday 13th September at 7.30pm on BBC One.